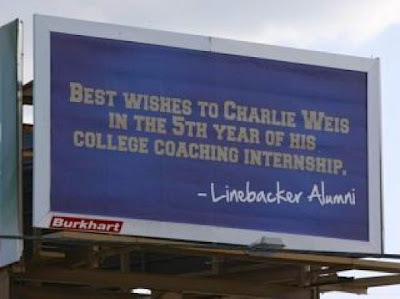 An Opinion On Sports: Charlie Weis: "Billboard Boy"! A new billboard facing the Notre Dame campus and located only about a half-mile from Charlie Weis' office subtly offers a good luck wish to the head coach. In this instance, it is felt the honeymoon with Weis and the Irish is long over and it's time to for him to win big in South Bend. If this turns out to be another disappointing season for the Fightin' Irish faithful, the next billboard will probably be pointing Weis on a quick route out of town. How about "Out of Time , Out of Town"? Like I said yesterday, it must be college football season.